A Newton man is in jail, charged in the death of a woman nearly three years ago. Twenty-five-year-old Samantha Raper of Kellogg died on January 17, 2015 after being found unresponsive in the Newton home of 30-year-old Ross Wadzinski. It was determined Raper overdosed on Oxycodone. Wadzinski had maintained Raper took the Oxycodone herself, but he’s now admitted to police that he helped her inject the drugs. Wadzinski is charged involuntary manslaughter and possession of a controlled substance with intent to deliver. On January 17, 2015 Newton Police were called to 730 W 12th St S for the apparent overdose death of 25 year old Samantha Raper of Kellogg. 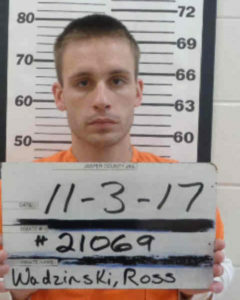 During the investigation it was discovered that Raper had reportedly injected two 30 mg Oxycodone tablets earlier in the evening, while at the residence with 30 year old Ross Wadzinski of Newton. Wadzinski admitted to investigators that he had been using narcotics with Raper but indicated that she had bought and injected the pills herself. Wadzinski also fell asleep and awoke shortly after 2:00AM and found her not breathing. An autopsy was performed and toxicology indicated a large amount of Oxycodone in her system which was consistent with Wadzinski’s statement to investigators. On Wednesday, October 25, 2017 Ross Wadzinski came to the Newton Police Department and indicated that he needed to talk to police. In a statement to police he stated that he had actually injected the drugs into Raper because she couldn’t do so herself and asked him to help her. With this new information Wadzinski is charged with Possession with Intent to Deliver a Controlled Substance (C Felony), and Involuntary Manslaughter (D Felony).